When I was younger (let's just say back in the 80s) it seemed like someone always brought a Ramen Noodle Salad to parties. I tried it a few times but was never really wowed by it. I mean, it's raw, cheap, crunchy ramen noodles mixed with some veggies and a sweet dressing. 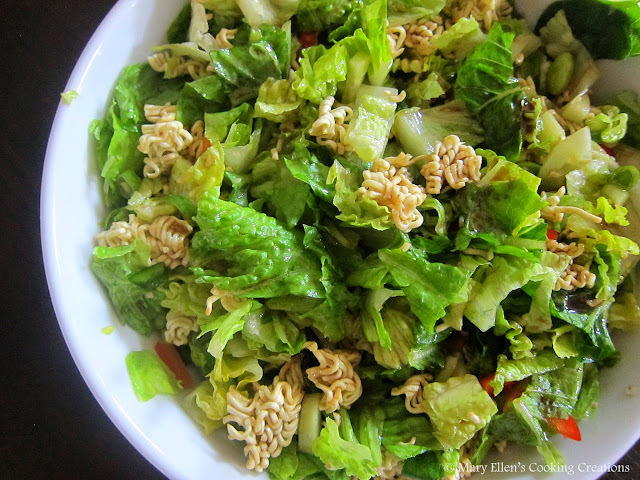 I wonder who first created this recipe and thought it was a good idea to mix these noodles with salad? Hmm, I wonder if it was an accident and the noodles fell in to the bowl. Now I'm really interested in tracing this recipe back to its origins! Does anyone know? 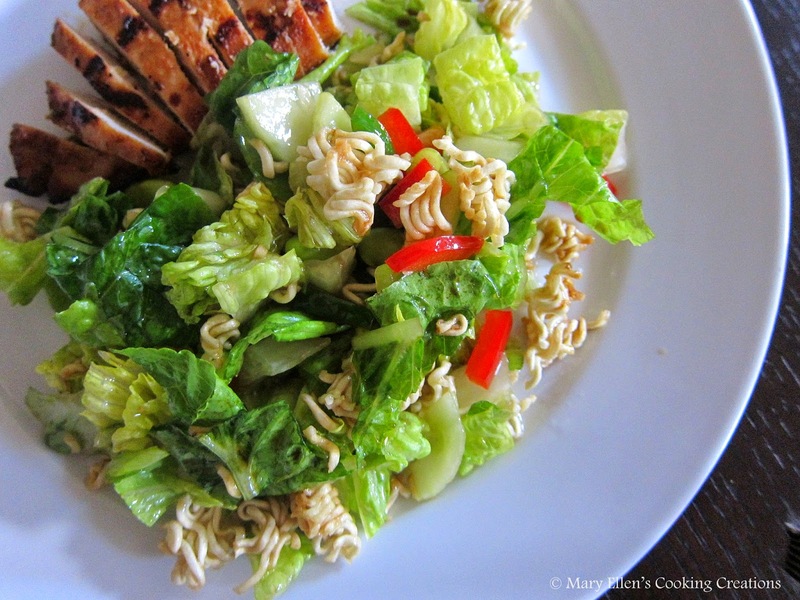 I made the original Ramen Noodle Salad once about 10 years ago and failed miserably... I can't believe I'm even admitting that. I mixed the dressing the night before I planned on taking it to a party which made everything wilt horribly. I didn't even discover my mistake until 25 minutes before we were leaving for the party so I ended up having to pick up a dessert at the last minute so I wouldn't show up empty handed. At least I can blame it on the fact that I had no interest in cooking at all 10 years ago and luckily I now know better. Fast forward to 10 years later when I'm talking to Jon about what to make for dinner and he said "how about that Ramen noodle salad?" I guess he forgot that we never actually ate it, but for some reason he was craving it. I didn't feel like running back to the supermarket so decided to wing it using ingredients I already had on hand. I think the traditional recipe calls for Napa cabbage. I already had romaine lettuce so used that. I also added some veggies not in the traditional recipe, and I pulled together a dressing based on some things I have made in the past. The end result - a light, fresh salad with great texture from the crunchy veggies and noodles. I'll definitely make this modernized version again! I served it with grilled chicken that had been marinated in a soy/sesame/garlic/sriracha mixture. Mix all ingredients for the dressing and chill. Shake well before serving. Mix all of the veggies for the salad and chill. Before serving mix in the noodles and toss with the dressing.